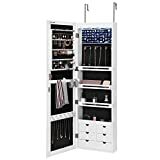 You are in Emporium Shopping online department store, category, department looking for items SONGMICS LED Cabinet Armoire with 6 Drawers Lockable Door Wall Mounted Jewelry Organizer White UJJC88W. The SONGMICS Jewelry Cabinet is perfect to organize your precious jewelries, cosmetics and accessories. No need to search for the loosing earrings or untangle the mixed up necklaces anymore! It makes your daily dressing up much easier with 65 ring slots, 40 stud holes, 24 necklace hooks, 6 drawers, 4 metal earring rods, 3 shelves and 1 bracelet rod. Durable MDF frame ensures stability and soft velvet lining protect your jewelries from scratches. Real glass mirror helps avoid the "fun house" effect and provides better performance. Auto on and off LED lights keep your valuables classy and luxurious in look. Elegant style is ideal for your bedroom, closet, or bathroom! Bring it home, surely you will be surprised and love it very much.Specifications:- Color: White- Material: Real Glass, Quality MDF, Soft Velvet- Mirror Size: 43 7/8''H x 10 3/8''L (111.5 x 26.5cm)- Overall Size: 47 1/8''H x 14 3/8''W x 4 7/8''D (119.8 x 36.5 x 12.3cm)- Product Weight: 27.3lbs (12.4kg)- Assembly Required: NoPackage Contents: - 1 x Jewelry Cabinet- 2 x Door Hook- 1 x Instruction- 1 x Pack of Accessories Notes: - The maximum opening angle of the cabinet door is 120゜.- Please remove batteries when the LED lights are not used for a long time. Thank you for visiting our store and shopping SONGMICS LED Cabinet Armoire with 6 Drawers Lockable Door Wall Mounted Jewelry Organizer White UJJC88W with us. Come back to buy online.